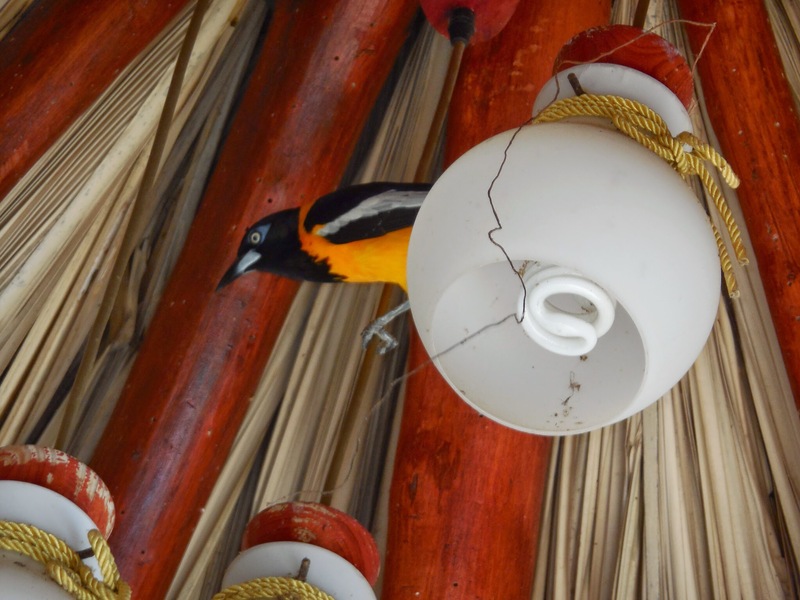 Our hut near the pool with this bright colored bird who has the MOST BEAUTIFUL SONG !!! I am convinced, it must be in the Oriole family. However, since a lot of the locals really don't know what kind it is, I just had to listen and watch it as it makes it's way around our pool daily. Sharing with Madge, at Rurality Blog Hop. It looks like a Baltimore Oriole to me. Whatever it is it sure is pretty. Good catch! It does look like some kid of oriole or magpie. I would be thrilled to see one of these! Pretty! I'd guess a Baltimore Oriole, too. Birds in the wild don't always have the exact colors we're accustomed to seeing. There's lots of variations -- juvenile, molting, leucistic, or whatever. At this time of year, you can see just about anything. This guy should be headed north! But then, again, you are off the coast of South America. There just might be an oriole species native to there. Interesting. Good shot. See it's eyes are so powerful! What a beautiful bird. I love your pics of Aruba. Looks like a relaxing time. One time when we went to St. Thomas, there were iguanas everywhere! Just like squirrels here! Did you eat at Coconuts?!!?! WOW, that bird is so pretty!